The Robert Boyle Lecture Theatre was fully refurbished and the AV system upgraded to include dual data projection. There was also the creation of a new university event space within the old ‘Boiler House’ which includes a projection and high quality sound system. During a full refurbishment of the teaching facilities within the Anatomy and Clinical Skills area this summer we worked closely with colleagues in ESS and the Faculty of Medical Sciences to design a very complex AV systems to allow flexible and high quality facilities to the three main labs and individual bays. Four dedicated teaching locations were set up allowing the spaces to be used independently or combined in various combinations for larger cohorts or future expansion. 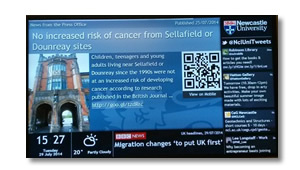 High resolution displays have been provided throughout the solution to ensure the highest quality resolution possible given the nature of the content being viewed in these areas. Following successful pilots we have started phasing out VGA connectivity in our supported teaching spaces as it is now considered ‘past-its-sell-by-date’. All rooms will maintain HDMI cables but we are also providing additional functionality by way of a wireless system called ‘Solstice’. The Solstice system is selectable from the AV control panel and by following some simple instructions on the main display screen you can present wirelessly from your laptop, tablet or even you phone. For the more adventurous there is also the ability to enable collaboration with the class by allowing screen sharing to and from student devices. Spaces upgraded this summer include wireless connectivity and we will continue to enable more spaces over coming years. The University Campus Messaging System has been undergoing an overhaul and upgrade during the last couple of months. Now that we are nearing the end of this project we thought it timely to give a more detailed update on what’s been done. Together this ultimately would provide a more interesting, visible, resilient and higher quality system across most high-traffic student footfall areas on campus and beyond. Mike Sales from NUIT Research and Collaborative Services developed the new content delivery system. He commented: “The system was developed based around the WordPress publishing platform, which offered greater control over individual displays and supporting multiple channels of prioritised content. WordPress was selected as the basis due to its intuitive, uncomplicated interface, enabling users to post messages quickly and easily. Other notable features include a variety of external news tickers, Twitter support, a weather widget and the ability to post video and full-screen imagery. Content customisation is a key feature of the new system which enables users to receive and display centrally provided content, such as news, events and high-priority messages, or define a mix of locally and centrally-sourced information. Content can be uploaded and made visible within minutes and users have the ability to customise their screens with their own brand identity”. The brief in terms of a new hardware solution was that the screens had to be bright, high quality, durable and energy efficient; Lee Harrison from NUIT AV Services led on this element of the project. Following substantial research and procurement tender we ultimately purchased a combination of 46” and 55” NEC screens which would be driven from OPS ‘slot-in’ PCs attached to each unit. Working closely with colleagues in ESS, IT Service and the appointed AV contractor Roche Audio Visual we were able to collaborate effectively on the installation of infrastructure and hardware. Shout-outs specifically to Darren Fox, Dave Sharples and Steve Cuthill who were on hand to assist with infrastructure and system configuration elements when required! The first phase installation was planned over a period of ten working days in June where we replaced hardware in 18 existing locations and installed new systems in another 25 locations on campus. ‌Despite the relatively tight timescale and having to do some running around the new systems on campus were up and running for the Universtiy Visit Days on 27th & 28th June! 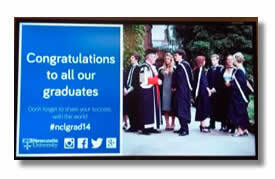 Our second phase will see an additional 10 screens installed across campus and accommodation sites in coming weeks. For those interested in the ‘green’ elements we will have increased the hardware provision by over 190% on completion however there will be actually be a marginal decrease in overall energy consumption due to the hardware we have deployed. The ongoing management of the Campus Messaging Service has also been given an overhaul in that Press and PR have full ownership and management responsibility of content and the IT Service provide hardware and software support. We will happily provide any further information if anyone has any questions and would be very interested to get any feedback on the screens or content.